The Tony Backhouse Capricorn Gospel Choir Workshop has been made possible with the support of the Livingstone Shire Councils’ Regional Arts Development Fund (RADF) grant. Internationally acclaimed leader in the Australasian a cappella movement is coming to Yeppoon. 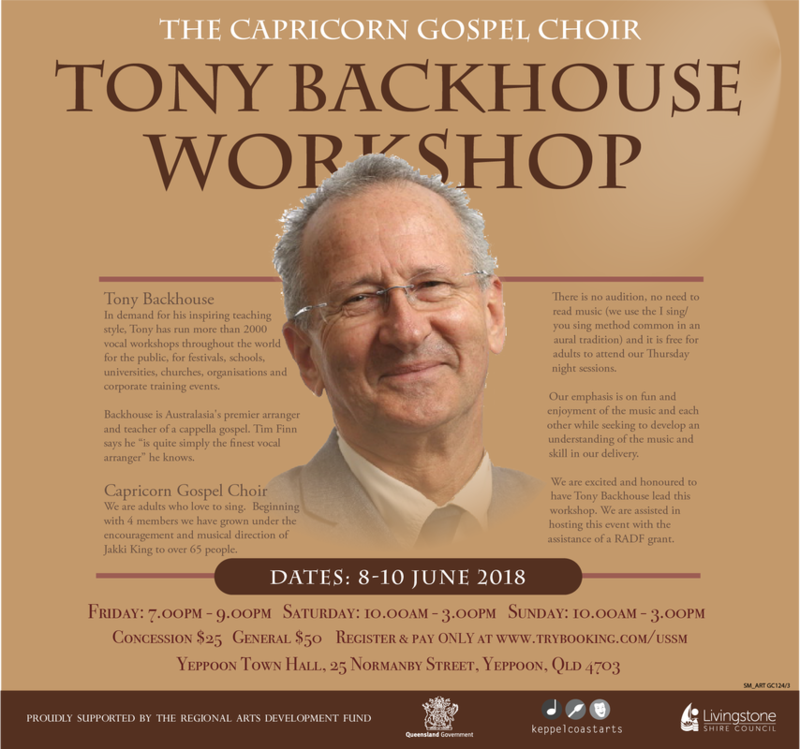 The Capricorn Gospel Choir has confirmed they are staging a three-day workshop here on the Capricorn Coast with the illustrious master of cappella, Mr Tony Backhouse. In demand for his inspiring teaching style, Tony has run more than 2000 vocal workshops throughout the world for the public, for festivals, schools, universities, churches, organisations and corporate training events. Tim Finn (Split Enz and Cowded House fame) states that Tony Backhouse "is quite simply the best vocal arranger I know”. This is testament to Tony's pre-eminence as an arranger and teacher of this acapella form. His career achievements highlight his popularity and Backhouse has performed in many festivals including, Womadelaide, Womad New Zealand, New Orleans Jazz and Heritage Festival, WLOK Stone Soul Music, Memphis, East Coast blues and Roots Festival (Byron Bay), West Coast Sacred Music Festival (Vancouver), West Coast A cappella Summit (San Francisco), World Choral Symposium, Sydney, Jazz-en-Souillac (France), Festival of Voices (Tasmania) and the Roses Blues and Jazz Festival (Spain) to name a few.